I’m personally not that much of a chocolate fan. Don’t get me wrong, it’s not that I don’t like chocolate. I’ve just never been one of those ‘must HAVE chocolate’ types but that all changed when I decided to make a chocolate mousse as part of a trio of desserts for my husband’s 40th birthday. 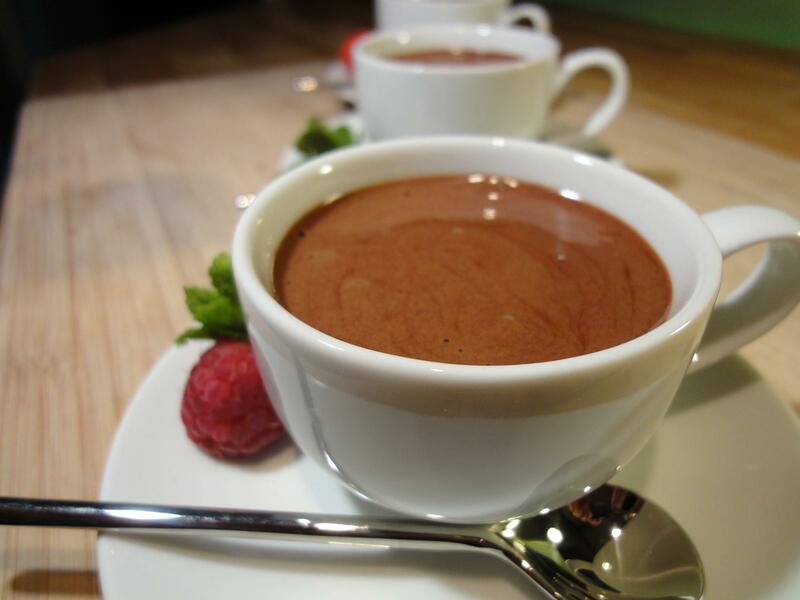 This recipe is an adaptation of Tamasin Day-Lewis’s Rich Chocolate Mousse (Great British Classics). I made a trial batch a week before his birthday, another batch for the actual dinner and a third batch a month after. Each time, I altered the recipe slightly to experiment with the taste and texture. What I wanted to create was a chocolate mousse that wasn’t too dense, remained rich and chocolatey but was light and fluffy at the same time. I think I’ve cracked it now but this is one recipe I’ll probably keep experimenting with because 1) it really is divine, and 2) anyone, and I mean anyone, can make it. Apart from melting the chocolate, there’s no cooking involved. Therefore, there’s no way you can mess up this recipe. 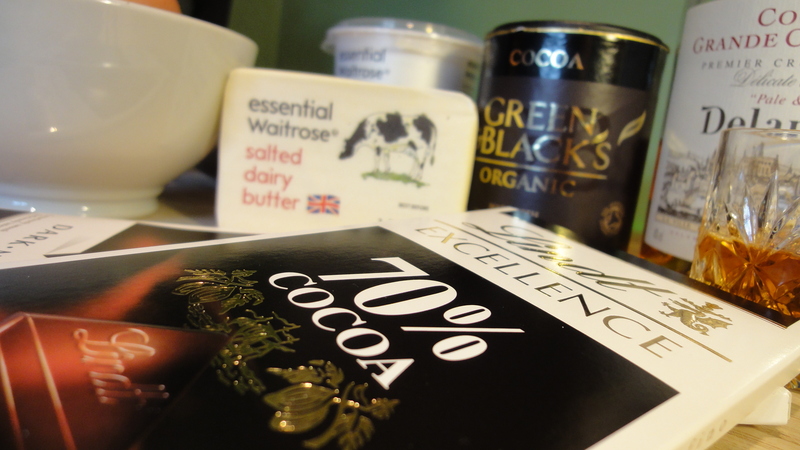 So, feel free to play around with the quantities of ingredients or types of chocolate or alcohol. I have provided the ingredients from the first two trials in case you fancy giving them a go too. Weigh out all the ingredients and make sure you have 1 bowl for melting the chocolate, a small saucepan of gently simmering water on the stove and another clean bowl for beating the egg whites. 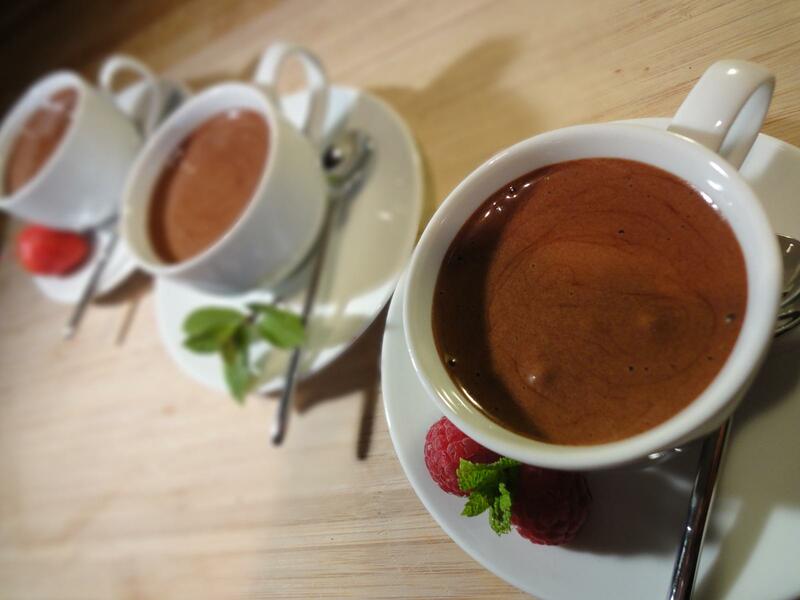 I put my Nutella jars/glasses to good use and with this recipe; you can normally fill about 6-7 Nutella glasses (consider each a double/sharing portion) but for the birthday, I went a wee bit poncey and served the mousse in little espresso cups. Put 40g of the sugar, all 5 egg yolks, the cocoa powder and the cream together into a bowl. Place the bowl over the simmering saucepan of boiling water (make sure your bowl doesn’t touch the boiling water) and mix until everything’s combined. You want to keep stirring this until the mixture coats the back of the spoon (don’t worry it if looks like not all the cocoa powder’s dissolved because it never dissolves fully whenever I’ve made the mousse). Turn off the heat and start adding the butter and chocolate pieces, a bit at a time, and keep mixing until everything’s melted and you’ll have beautiful bowl of dark, velvety and glossy chocolate. At this time, stir in your alcohol of choice! Leave to the side to cool and in another bowl (make sure this doesn’t have any trace of egg yolk! 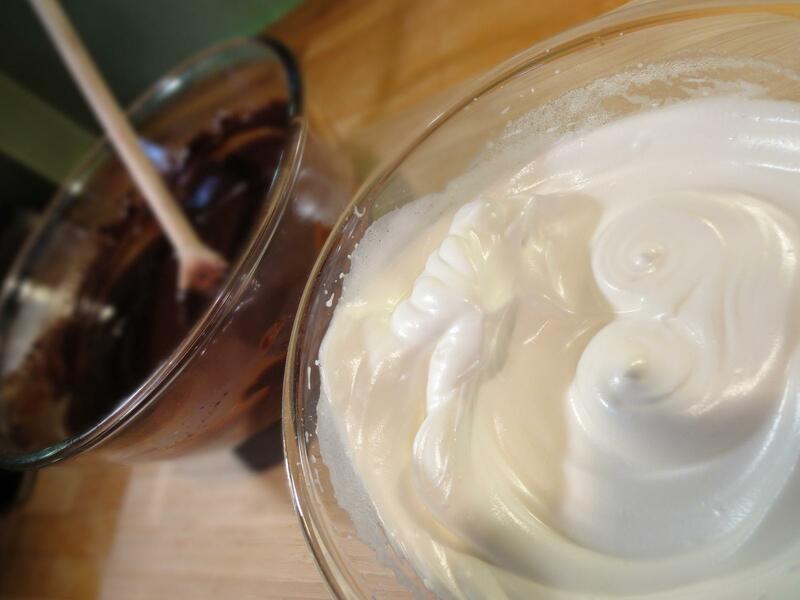 ), beat the egg whites until frothy and start adding the remaining sugar in staggered amounts until the egg white mixture is shiny and stiff (like the consistency of a meringue mixture). Spoon a dollop of the egg white mixture into the chocolate and start folding it in until all the egg white is combined with the chocolate. When you’re ready, spoon your mixture into your individual serving pots or you can also set it in a large bowl. You can actually eat the chocolate mousse immediately but it’s always nicer if you refrigerate it. It’ll never set to a firm texture but is more like gooey honey, that’s until you put into your mouth and it literally melts and slides down your throat. Absolute. Chocolate. Heaven. I only used Cadbury’s drinking chocolate powder because the first time I made this, I forgot to buy proper chocolate powder. I also used a different mix of eggs. The result is a thicker, denser and more sugary chocolate mousse. You only got the slightest hint of armagnac because I only used 1 tablespoon. Strangely enough, this mousse was at its best when we’d left it to set in the fridge for 3 days. The result was a fluffier and really decadent mousse. This is definitely one for the adults only because the cognac provides a heady bouquet that sits gently on your tongue long after the chocolate mousse has melted. Mmmmm… yum-O.